With everyone's thoughts on Christmas, it might be worth practicing your English Trifle before the festive season gets underway. 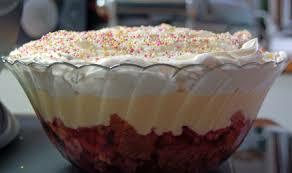 Trifle is a popular dessert - maybe because of all the 'booze' hidden within its creaminess. This trifle is best made the day before it is needed so the flavours can infuse together overnight. Cut the sponge cakes in half, spread them with jam and sandwich them together. Cut each into 8 pieces and place them in the bottom of a glass bowl. Pour the sherry and brandy on top. Heat the milk in a saucepan. Beat the eggs and sugar together until creamy, then pour on the hot milk. Mix well, then tip back into the saucepan and heat gently, stirring, until the custard thickens. Leave the mixture to cool slightly, then pour it over then sponge cakes and leave until cold. Spread the whipped cream over the top of the trifle and decorate with grated chocolate. 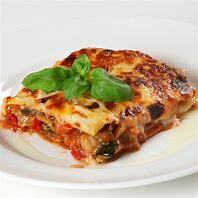 Pop into the fridge until you wish to eat it.